500+ sample plans to inspire you, help and guidance every step of the way, and a money-back guarantee if you're not satisfied. A template won't guide you through the process of writing your business plan. It's just a bunch of blanks for you to fill in, with none of the samples, expert advice, or financial formulas you need to create a plan that gets results. That's why you need Business Plan Pro. 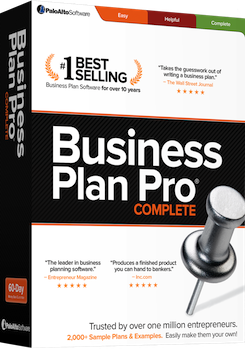 What do you get with Business Plan Pro? No matter your industry, there's a sample plan that will work for you. Use one for inspiration or as a starting point for your own plan. Plus, examples are everywhere, so you'll never wonder what you should write. You know your business, but you might not know that much about business plans. Don't worry — Business Plan Pro has you covered, with expert advice, guidance, and resources. No other software is backed by as much expertise. Your plan will look like a professional wrote it, with eye-catching charts and graphs created automatically based on your numbers. Business Plan Pro formats your plan the way bankers, investors, and SBA-approved lenders expect. A free subscription to Inc. Magazine, free e-books, legal tools, presentation tools, secure site to publish and share your plan with anyone you invite... and more! Tons of discounts and free extras pay for the software before you even start your plan. Where do you find the details, especially the numbers, to finish your plan? When you use Business Plan Pro, you get profiles of over 9,000 industries, complete with financial information you can use for your plan. Ask anyone — the hardest part of a business plan is the financials. Business Plan Pro makes financials a breeze, with built-in formulas that take the pressure off you. Let the software do the math while you concentrate on your bottom line. Your business is unique, and your business plan should be too. That's why Business Plan Pro asks you a few simple questions and then creates an outline for your particular business for you. If you're not 100% satisfied, you have 60 days to let us know and we'll refund your money, no questions asked. All you have to do is send us an email. Try our software risk free for 60 days! We back our Business Plan Pro, Marketing Plan Pro, and Start, Run & Grow software products with a 60-day money-back guarantee. If you are not 100% satisfied with your purchase, we will refund your money. No questions asked. Please note that this is our personal guarantee on our own products. Industry reports, books, and other items provided by our partner companies are not included in the 60-day guarantee offer, although we will of course do everything in our power to make sure you are satisfied with your purchase. Whether you have a great business idea, a golden opportunity to get investor funding, or you just need your business to run more smoothly, you need a business plan.